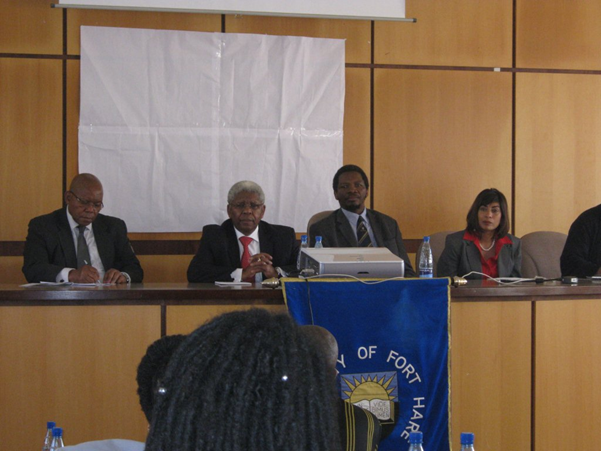 A Colloquium on Cultural Excellence in Education was held in partnership with the University of Fort Hare on 22nd September 2010 in Alice, Eastern Cape. Cultural Excellence has emerged as an important aspiration in the debate about education. There is this sense that not only is our education system failing to develop the necessary Science and Mathematics skills but that it is also failing us culturally. But what does this concept of Cultural Excellence mean in practice? What relevance does it have to the revitalisation of education in South Africa? What can be done to embed it within the education agenda? This Colloquium sought to explore how the idea of cultural excellence – as an important component of educational excellence – can be given practical expression in our education system at all levels. The event brought together an interesting mix of more than one hundred outstanding people drawn from the realms of arts and culture, education, academia, business and religion and explored this challenging theme with a view to developing a practical approach to embedding cultural renewal in education. Dr Mvuyo Tom, Principal and Vice Chancellor welcomed those present to the University of Fort Hare and Dr Ben Ngubane, Chairperson of SABC Board presented the key-note address. “Dr Jordan’s idea was to make the Historic Schools Restoration Project to be part of a wider national movement to revive a culture of learning and also to revitalize African culture and to reclaim parts of African heritage that were ignored and marginalized during the apartheid years. We all have a stake in ensuring the success of our children, and we can succeed in this if we ensure effective parent and community partnerships which help us improve learning. Such partnerships initiate and maintain dialogue- a necessary condition for cultural excellence in education. Our Historic Schools were important pivots between community, learning and religious values. We need to bring cultural excellence in education, which animated literary and political giants such as Ntsikana, Henry Masila Ndawo, James R Jolobe, John Dube, Benedict Vilakazi and many others, to bear on the present challenges we face in education in our country.” – Dr Ben Ngubane. “Perspectives on cultural excellence – what do I understand by cultural excellence? Why is it a useful idea in education renewal? What can be done to take it further?” The panellists were: Dr. Sindiwe Magona (writer); Professor Peter Dzvimbo (Deputy Executive Dean of Education and Research at UNISA); Ms Malika Ndlovu (poet); and Mr Wiseman Mupindu (PHD student at University of Fort Hare). Ms Nomfundo Walaza (CEO Desmond Tutu Peace Centre); Dr. Shermain Mannah (Department of Basic Education); and Professor Andre Keet (University of Fort Hare). The information from the panellists and the additional reference material provided were both fascinating and timely and well received by those present. Professor John Hendricks of Fort Hare University described the event as “a very rich conversation that begs to continue and Fort Hare will ensure it becomes an annual event”.